This week I’m introducing you to a new and different style of food blogs. Meet Vanessa who is a Brit living in Bangkok. Vanessa travels throughout Asia for her job with a humanitarian organisation. She works with poor people in Asia who can’t afford the most basic food. So basically, she is their miracle worker! How wonderful! Vanessa’s blog, Mango-Ginger is all about Asian fusion flavours but for the western kitchen. Everything she posts had the drool factor and is written in an easy to understand way. I, myself, love some Asian food and have been subscribed to Vanessa’s blog for a while. Up until I found myself being scared to try creating Asian foods at home but Vanessa’s easy style of writing has taken care of that and she has some wonderful exotic recipes on her blog. My name is Vanessa and I have an Asian Fusion food blog called Mango Ginger. I have also recently started hosting supper clubs in Bangkok where I serve up the best of Mango Ginger fare in my home. I am happy in my little world of spicy, savory, umami goodness. When I told friends that I would be guest posting on a baking blog, their reactions were variation on, “are you out of your mind?”, “but you can’t bake”, and “this is food blogging suicide”. They have a point, desserts have never been my forte. My cakes sink, stay raw in the middle, or turn into bread. And then there are girls like Lisa. Flawless fluffy cakes, perfect pastries, precision icing and colours to die for. 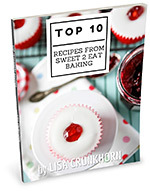 Lisa, I admire your work, even if you do make me feel so inadequate every time you post a new recipe! So how am I daring to post one of my recipes alongside such perfection? Well, I do like a good challenge. And I want to learn. I want practice and get better and create desserts that I can be proud of. Coming up with a blog-worthy recipe which I thought wouldn’t make Lisa and her followers hate me took no fewer than four attempts. I’ll spare you the details of the disastrous first three (one so bad that even the ants in Bangkok wouldn’t eat it). But I’m going to be bold and say that this one is good. Actually, it’s really really good. And it’s interesting and original. I know it feels counter-intuitive to put fresh coriander in a sweet dish, but think of it as mint, which often makes its way into desserts unquestioned. The delicate flavours of coriander, mango and ginger are the perfect end to an Asian meal. And the creamy filling is as smooth and light as cheesecakes go, perfectly manageable after a curry. So this is my new signature dessert. I hope you enjoy it and thank you Lisa for giving welcoming me! This Mango, Ginger and Coriander cheesecake is an east meets west Asian fusion recipe with refreshing and light fruit and spices. A perfect dessert for a warm summers day and great after a good curry! First make the base. Start by turning the biscuits into fine crumbs, either using a food processor or by putting them in a plastic bag and crushing them with a rolling pin. Add the dry coriander. Melt the butter and add to the biscuit mixture. Combine well and then tip it into a 9” spring-form cake tin. Using the back of a spoon, press the mixture down to form an evenly packed base. Put in the fridge to set. Then make the filling. In a blender puree the flesh of 2 mangos. Put half in the fridge for later – you’ll use this for your topping. Dissolve the gelatin in about a third of a mug of warm water and leave to cool. Very finely chop the ginger and fresh coriander and set aside. In a large mixing bowl, combine the cream cheese, sugar and icing sugar using a spoon to mix vigorously. Then stir in the mango puree and gelatin. In a separate bowl whip the cream until soft peaks form. Stir this in gently to the cream cheese mixture. Gently fold in the ginger and fresh coriander until evenly mixed in. Pour the mixture into the tin on top of the biscuit base and transfer to the fridge. Allow to chill for at least 2 hours before adding the topping. For the topping add the juice of one lime the remaining mango puree. Dissolve 1 tsp gelatin in about 3 tbsp warm water and add to the mango mixture, stirring well. Pour the topping over the top spread it out evenly using a spoon. Return the cake to the fridge. Leave it to chill for at least another 3 hours – but ideally overnight. Carefully remove from the tin and transfer to a plate or cake stand. Serve to round of a delicious Asian feast! Thank you Vanessa for the wonderful, different cheesecake. It looks wonderfully exotic! If you haven’t checked out Vanessa’s blog yet. Do it, do it now! If you’re interested in guest posting here, please see this page, then contact me. Thank you. I’m really glad to meet Vanessa and this gorgeous cake!